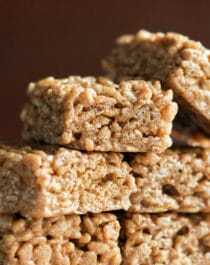 These easy, no-bake Maple Pecan Krispy Treats are chewy, crunchy, 100% delicious, and secretly healthy! You’d never know they’re refined sugar free, high protein, and gluten free too. 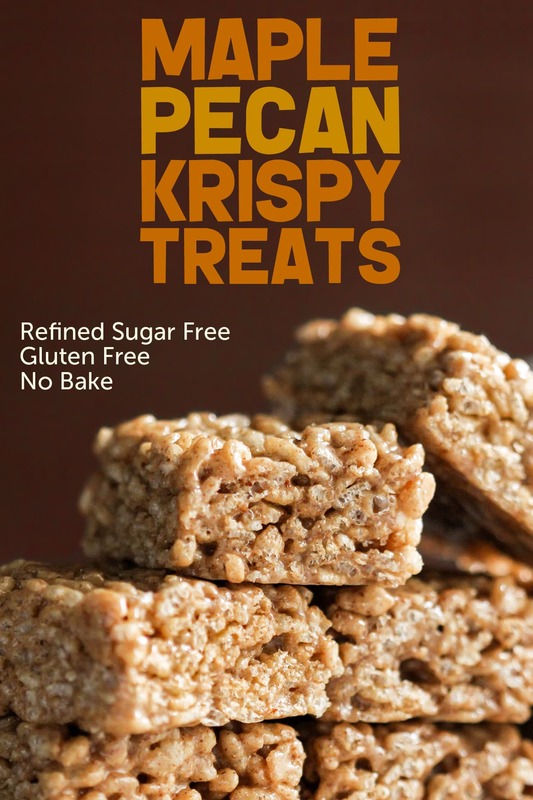 These homemade krispy treats beat those lame-o store-bought treats, by a long shot! Sweet, rich and decadent treats that are also whole grain, refined sugar free and gluten free (but you would never know!) Totally different than the “food-like” products at the grocery store, you know, that “stuff” in the blue wrapper? Those are 100% artificial, full of refined white sugar, high-fructose corn syrup and unhealthy fats. Grrrross! These are supremely chewy and ultimately sweet. These are some healthy snacks that you can sink your teeth into. Line an 8x8" brownie pan with parchment paper both ways. In a medium-sized mixing bowl, add the rice cereal. In a small bowl, whisk together the protein powder, cinnamon, and salt. In a large microwave-safe bowl, stir together the brown rice syrup, pecan butter, and maple syrup. Microwave at 20 second intervals, stirring between each one, until warm and drippy. Stir in the stevia extract, maple flavor, and butter flavor. Stir in the protein powder mixture. Dump in the cereal and fold together. Feel free to fold in some chopped pecans! Scoop the mixture into the prepared pan and flatten it out. Cover and refrigerate for 3+ hours. Slice, serve, and enjoy! I made a variation of this recipe and thought it was delicious too, so I'm posting it here in case you wanted to try this one too! 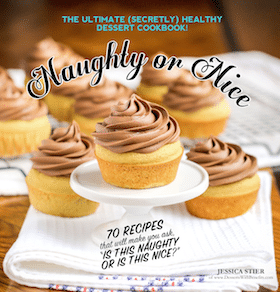 Much healthier than typical frostings, made with a ton of powdered sugar and too much shortening for comfort. 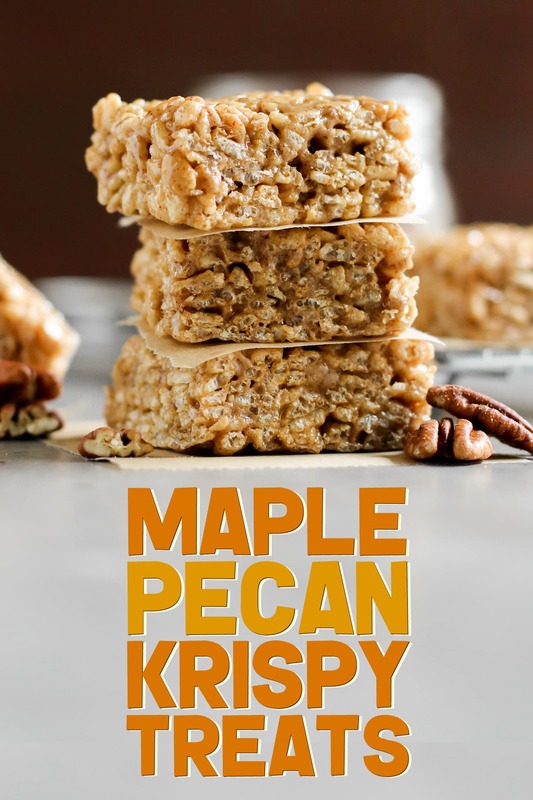 These Maple Pecan Krispy Treats are a way better option than the store-bought variety. Instead of using super sugary marshmallows and butter, I used a mixture of Homemade Pecan Butter, pure maple syrup, and brown rice syrup. For extra nutrition bonus points, I added some protein powder so that the treats were a little more nutritionally balanced. I’m sure you can substitute the whey protein isolate with your protein powder of choice — whey protein, egg white protein, brown rice protein, etc. just know that the amount needed will be different. 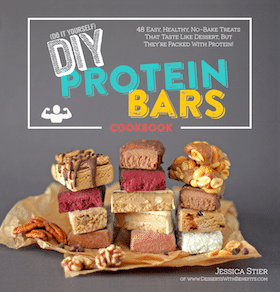 You can also try omitting the protein powder completely, but I haven’t tried it. I’m sure it will be just fine without it! 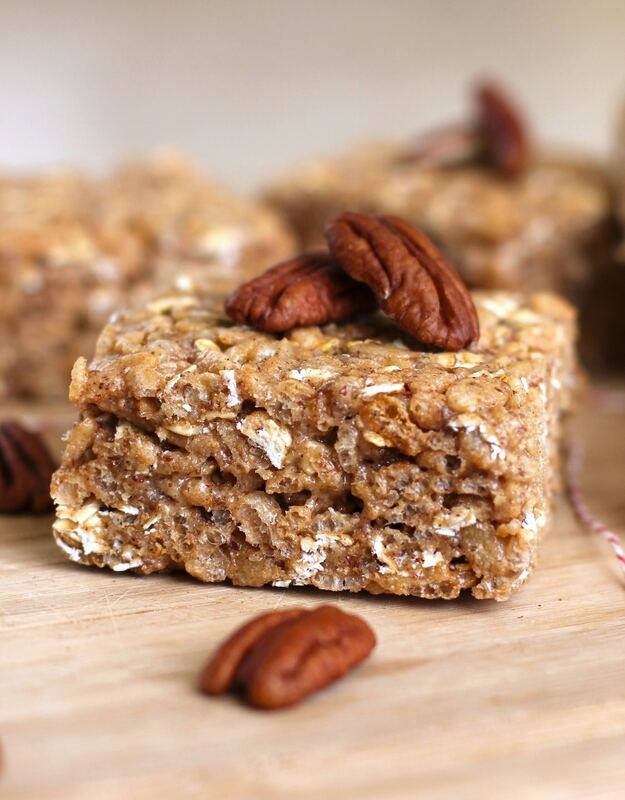 These Healthy Maple Pecan Krispy Treats would make a great gift to the people you love and care oh so much about. My family adored them. You’ll be in shock at how good these taste, especially for how healthy they are! I made these over the weekend for a party and they were a huge hit! Many people asked for the recipe! Shared these with my boss. We both love ’em. I didn’t have pecan butter, so I used peanut butter mixed with raw coconut butter. I made it more like 1/3 c rather than 1/2, and they came out great! I’m wondering about the nutritional info. How much fat per serving? 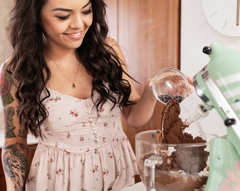 If you used 1/3 cup rather than 1/2 cup and sliced the treats into 9, there should be approximately 5-7g of fat per serving (depends on the products you used). But remember, they are healthy fats!